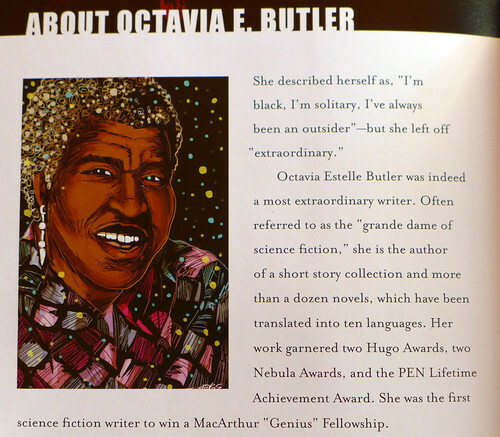 Inventive, hypnotic, unflinchingly honest – such is the work of Octavia Estelle Butler, and in Kindred: A Graphic Novel Adaptation, the grand dame of science fiction finally receives the graphic novel treatment she so desperately deserves. 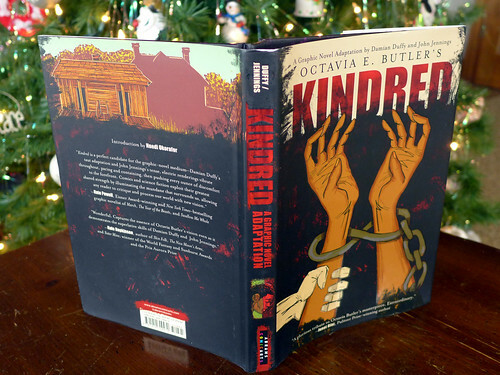 First published in 1979, Kindred tells the story of Dana, a modern black woman who is suddenly and inexplicably transported to the antebellum south. She finds herself on a Maryland plantation, circa 1812(-ish), placed directly in the path of a drowning boy named Rufus. Over a period of weeks (her time) and years (his), Rufus will unconsciously summon Dana to his side whenever his life is endangered. Though she’s often tempted to let the selfish young man – and heir to the Weylin plantation – die, to do so would threaten her very existence. 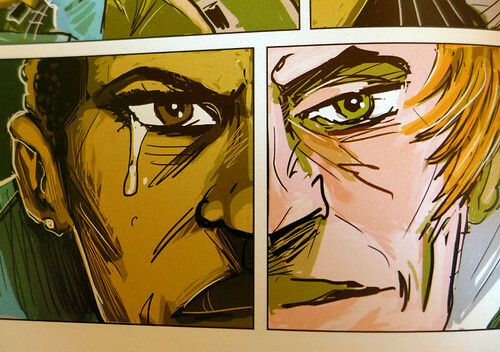 Rufus is Dana’s distant ancestor, and her life depends on the continuation of his. That is, at least until Grandmother Hagar Weylin has a chance to be born. There’s a well-known nerdy maxim (or trope, if you prefer) that time travel isn’t safe for black people, or women, or [insert your marginalized group here]. Time travel is “exclusively a white [male] privilege,” as Louis CK put it. Kindred manifests this principle in ways both chilling and potent. 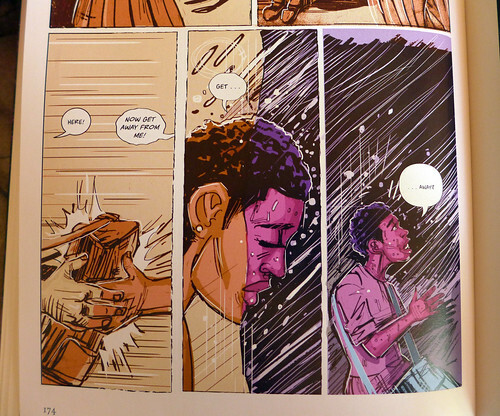 Dana uses her time in the past to try and change things for the better, if only in tiny increments: she surreptitiously teaches some of the enslaved children to read, and attempts to steer her great-grandfather in a more enlightened direction. Yet history is more likely to change Dana than vice versa, as she notes with shock and horror as she finds herself growing accustomed to the daily cruelties of slavery. Likewise, when Dana’s white husband Kevin is left stranded out of time – for a whopping five years, as she later learns – Dana is frightened of who or what she might find upon her return. How might an era steeped in racism and misogyny stain the man she loves? Kindred is one of my favorite books, by one of my favorite writers. The prospect of an adaptation left me both nervous and excited, which is par for the course when it comes to literature that’s burrowed its way into my heart and mind. But Damian Duffy’s translation of the work is masterful; he mostly captures the spirit and tone of the original, and deftly condenses the novel into a comic book format. From the first panel, which ominously proclaims “I lost an arm on my last trip home,” John Jennings’s artwork is moody and atmospheric. Many of the palettes are stripped down, with two or three colors dominating many of the scenes. and underscoring Dana’s trips through time and space with dramatic changes in color. 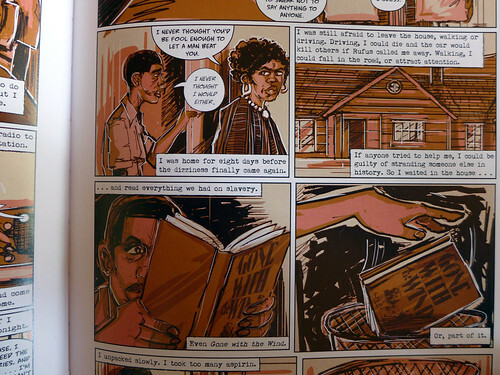 Some of the drawings, especially of Rufus and his father Tom, are a little rough around the edges – which struck me as perfectly apt, given the circumstances. Dana, on the other hand, is a near-perfect mirror image of how I envisioned her. Even the design of the book is breathtaking. 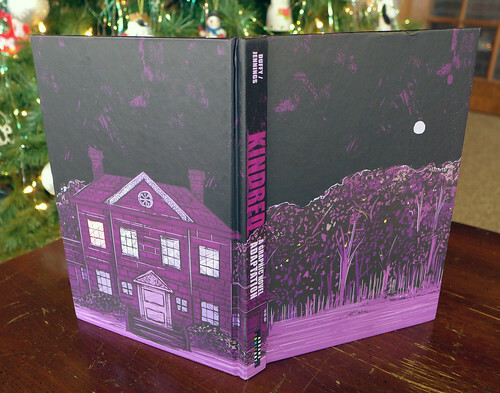 The book cover features an almost gothic landscape of dark purple trees against a black sky and lavender moon. On the back side, the Weylin house beckons. 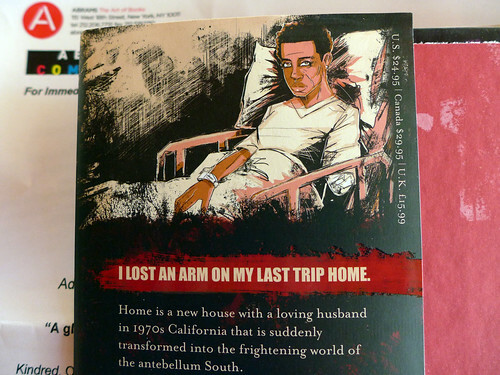 The first and last pages are splashes of red with streaks of pink; Dana, Isaac, or Alice’s skin after a brutal lashing. 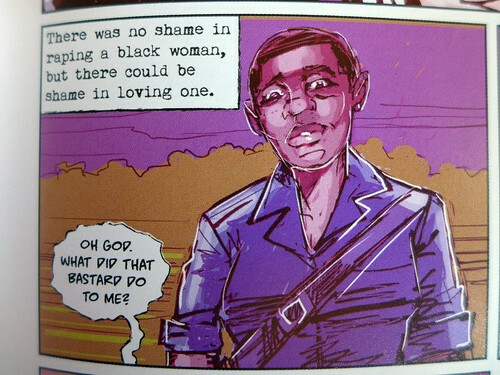 Kindred: A Graphic Novel Adaptation is a wonderful homage to Octavia Butler and the world she built, explored, and ultimately dismantled in Kindred. I hope it’s also a hint of what’s to come: from Kindred to the Parables duology, Lilith’s Brood to the Patternmaster series, Butler’s novels and short stories are all but begging for second lives on screens both big and small, panels in comic books and fan conventions the world over. May Damian Duffy and John Jennings’s work introduce a whole new generation of fans to this extraordinary writer. This entry was posted on Friday, July 21st, 2017 at 7:00 am. You can follow any responses to this entry through the RSS 2.0 feed. You can leave a response, or trackback from your own site.